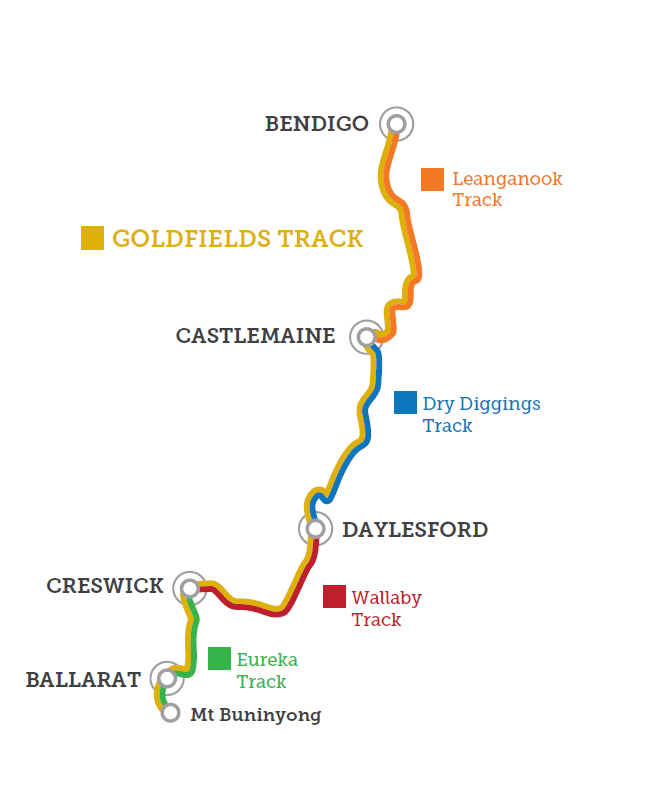 At 210km long, the Goldfields Track is the longest shared use track in Victoria. 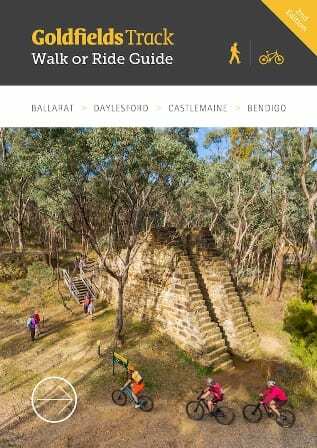 From its southern end at Mt Buniyong, it links the 1850s gold rush era towns of Ballarat, Creswick, Daylesford and Castlemaine to Bendigo. Whether you ride or walk, the Goldfields Track offers challenge and exhilaration as it crosses the Dividing Range and descends through forest to the northern plains. Unlike any other trail, the Goldfields Track embraces the boomtown heritage in towns strung out en route and follows the traces that the hundreds of thousands of ‘diggers’ left behind in forests and gullies, beside creeks and rivers, and on plains and mountaintops. 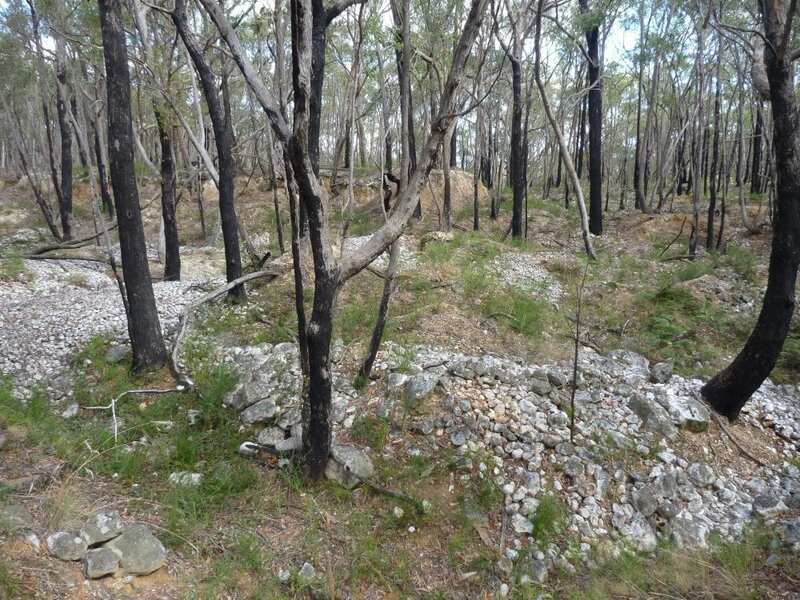 Cultural heritage is at the forefront of the Goldfields Track. With the diggers long gone, you contour high on water races through narrow, high-walled gullies pockmarked with mine shafts and riddled with stone ruins. You follow abandoned railway lines and timber tramway systems on embankments and through cuttings. You walk or ride beside the heritage-protected Coliban water channel, with its artificial bluestone-sculpted waterfalls and views across golden paddocks. 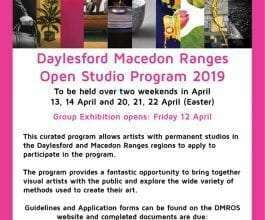 And when your legs are weary, there are plenty of pit stops and diversions at towns en route from the gracious elegance of Buninyong, Ballarat and Creswick to the mineral spas and bars of Daylesford and the arts and culture of Castlemaine and Bendigo. 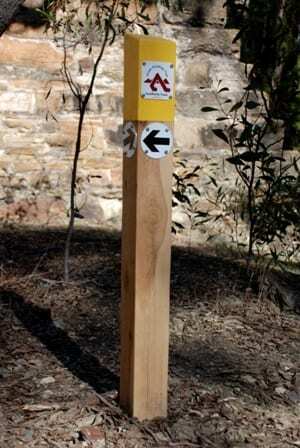 From an entry station or vehicle access point, it is just a matter of following the gold-painted posts with their distinctive Goldfields Track (GT) logo. In towns, you will see blue signs on street posts with the GT logo. 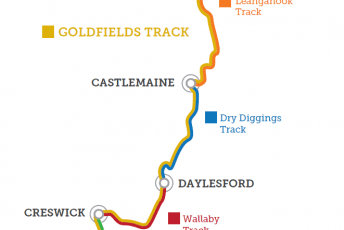 Each of the four tracks that make up the Goldfields Track is accessible by train. All major towns have good car access. Unlike many traditional dirt pump tracks, the Hammon Park Pump Track is covered in bitumen for a smoother and faster riding surface for mountain bikers, skateboarders and scooter riders to enjoy, and is already being hailed by riders for its quality. 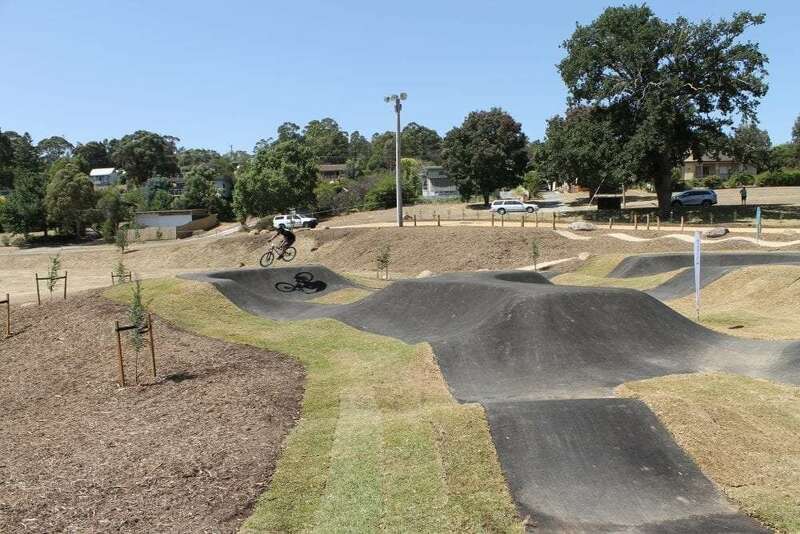 The Creswick Pump Track is conveniently located within walking distance of the town centre and is accessible by train or bus. The Hammon Park pump track is the first stage of the Creswick Trails Project which will see the creation of a 100 kilometre purpose-built mountain bike trail network.